Not reacting to gravity; that is, moving or turning away from the earth. 1. Of or pertaining to modeling in wax. 2. Applied to a kind of accent consisting in a lengthening of the time-value of the note; or accenting a musical note by extending it slightly beyond its normal time value. 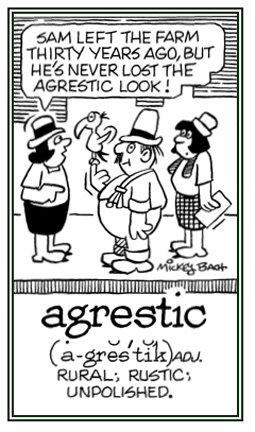 Also called agogic accent. A descriptive term for reactions and movements caused by an external agent, a stimulus, or some force. Showing page 8 out of 64 pages of 947 main-word entries or main-word-entry groups.